Consider this Chromebook if you just want a simple laptop for basic Web tasks, and only if you area already within (or considering using) Google’s ecosystem of products. If you’re not into Google services, then this laptop isn’t for you. If a little laptop for getting on the Internet and doing some basic browsing and word processing sounds like your cup of tea, then Acer’s Chromebook 11 (CB3-111) should be right up your alley. It’s an 11.6in laptop with a light weight and a small footprint that offers an easy way to work with Google's services. The Acer Chromebook 11 has a price tag of $329, and it offers enough CPU performance for most typical online tasks, be they email correspondence, video and music streaming, and document creation (through Google’s services). Since it runs Chrome OS rather than the Windows operating system, you can’t just install any programs on it that you’re used to. Instead, you will have to browse the Chrome OS Store to find any extra little things that you might want to use. For the most part, the Chromebook 11 is designed to be used with Gmail, Docs, Google Play, and other Google services, and it will work optimally when it’s online, though there is provision to use the laptop in offline mode. It's a laptop that's essentially ready to go from the moment you unbox it. If you already have a Google account, all you have to do is log in. If you’ve never used Chrome OS before, know that it’s basically like using the Chrome Web browser for everything. The only aspects of the operating system that aren’t in a Chrome Web browser window are the File manager (which is essentially the folder through which you can access downloads and files from USB storage devices), the image viewer, and any other apps that you download that run in their own window. The operating system hasn’t changed all that much since we first started reviewing Chromebooks, so look at our reviews of the first Chromebook we reviewed, the Samsung XE30C12, for more information on what the actual interface of the Chromebook is like. 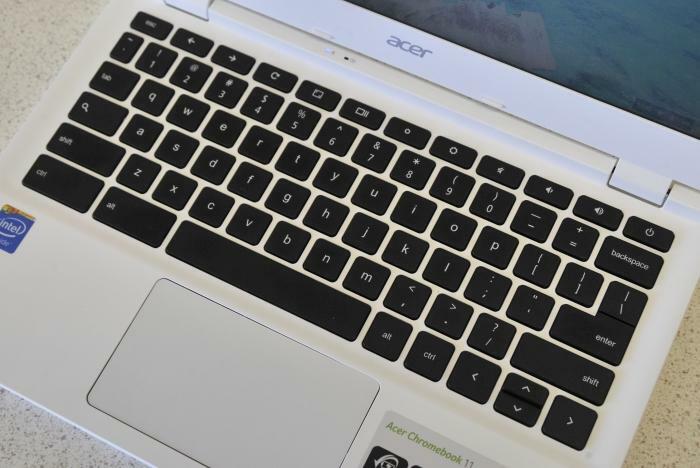 Physically, the Chromebook 11 is slightly different to the previous Acer Chromebook that we reviewed, the C720P. It weighs 1.08kg and has more of a streamlined look on its base and keyboard tray. It’s a laptop that looks attractive enough (though be careful not to scuff the white finish), and it’s light enough to be carried on a daily basis without much hassle (making it good for school, for example). The Chrome branding on the lid. The hinges now sit at the top rather than being right on the spine, and the port layout is a little bit different. They are relatively small changes that make the Chromebook look a little better overall, while the new hinge layout allows the screen to tilt back a little more than usual. Unlike the previous Acer Chromebooks, this one is a sealed unit that doesn’t have a vent to allow warm air to escape, nor did we detect the sound of a fan. It makes use of one of Intel’s latest Celeron processors, the N2830, which was released in early 2014 and is based on the ‘Bay Trail M’ architecture. It’s a CPU that is meant to run cool, and this was shown throughout our testing, during which the base of the Chromebook barely got warm. Storage is mostly by way of Google’s Drive (meaning it’s Cloud-based storage), though there is a 16GB solid state drive installed for you to store some local files. That space is also used to synchronise up to 5GB worth of Google Drive files so that you can work offline when you don’t have an Internet connection. It’s not overly fast, though, and this was shown in the online, browser-based tests that we ran. In comparison to the Acer C720 and the Acer C720P, the Acer Chromebook 11 recorded slower performance in the Sunspider, Octane, and Peacekeeper tests. That’s not to say that the notebook feels uncomfortable during everyday usage. We actually found it to be fine for Web browsing news sites and content aggregators. It also went okay when processing 1080p YouTube video, as well as streaming video from premium video services. The usual caveats apply, though: Web pages that are heavy will have the potential to slow down the device as the Celeron takes its time to process them. High-definition YouTube videos played back with some stuttering at the beginning of the clip before they got their groove on, while services such as NBA League Pass were watchable when we used mid-range quality settings, albeit with some noticeable skipped frames now and then (these showed clearly due to the fast-paced nature of the video content). Videos from Google’s Movie and TV service played back without any performance issues after we allowed the service to analyse the Chromebook in order to provide optimal playback. The screen has a native resolution of 1366x768, and it’s not glossy, so reflections from room lights won’t be bothersome. What will be bothersome are the viewing angles, which we found to be too narrow for comfortable viewing. It looks very much like a cheap screen — and it is a cheap laptop after all. A full-sized HDMI port resides at the rear of the Chromebook 11, and this position serves well when you want to use the laptop as a desktop device while plugged in to a monitor — the HDMI cable won’t be in the way. Since it’s a full sized port, you also won’t need an adapter for it; just plug in your regular HDMI cable. The rear has the full-sized HDMI port and the power port. On the left you get USB 3.0 and full-sized SD. On the right you get the USB 2.0 port, the headset port, and the cable lock facility. We plugged it in to a Full HD TV in order to watch some streaming video, and ChromeOS automatically extended the screen to the TV and used its native resolution. You also have the option of mirroring the screen, though this won’t look good on a Full HD screen that is forced to show the native resolution of the Chromebook. One of the other new pieces of tech in this laptop is 802.11ac Wi-Fi, which allows for quicker Wi-Fi data transfers as long as you have an 802.11ac wireless router, and you also get Bluetooth 4.0. We received mixed results when using Bluetooth. When connected to our Bluetooth-enabled Rotel amplifier, music that was streamed from Google Play sounded slow and choppy. However, when we connected to a small Lenco Bluetooth speaker, the sound was fine. The thing is, you are better off just using the Chromebook’s built-in stereo speakers rather than a little mono Bluetooth speaker. We would have preferred the Bluetooth to have worked better with our stereo system. For typing, the keyboard has soft keys that don’t make any noise when they are hit, though they do offer a bit of resistance. It’s a comfortable keyboard for long typing sessions, and the palm rest offers a large enough area to rest your wrists. They keyboard also has specific Chrome OS keys for navigating Web pages, and controlling brightness and volume. A touchpad of 105x60mm is smack-bang in the middle of the palm rest, and it didn’t get in the way while typing. It was responsive to our navigational needs, and it offers support for gestures such as two-finger scrolling, two-finger double-taps, three-finger swipes (for changing tabs), and two-finger swipes (for going back and forth on a site). You get two USB ports (one USB 2.0 on the right side and one USB 3.0 on the left side), there is a full-sized SD card slot, and also a headset port. A webcam sits just above the screen. Battery life is relatively short, though, with our video rundown test (looping a Full HD MP4 file with maximum screen brightness) giving us a time of 5hr 33min. This is 10min shorter than the time recorded by the C720P Chromebook. 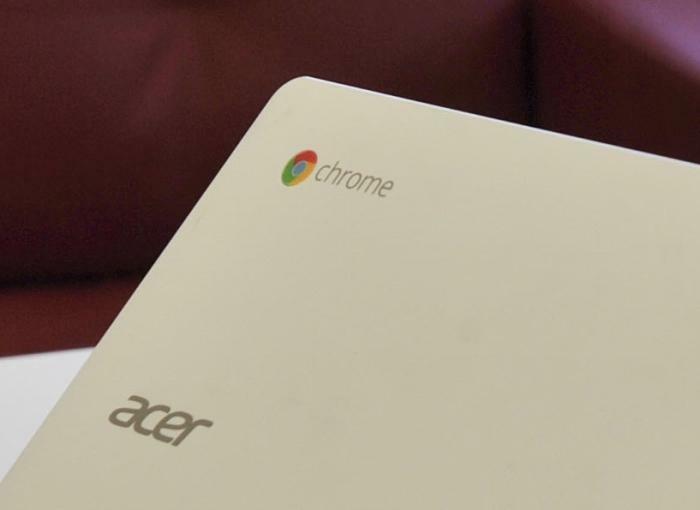 The Chromebook 11 is part of a Chrome OS ramp-up for Acer. It also released a couple of other Chrome-based computers: the Chromebook 13 and the Chromebox CX1. The Chromebook 13 is a 13-inch Chromebook with Nvidia Tegra graphics, while the CX1 is a Chromebox that’s small enough to be mounted on the rear of a TV or monitor. Furthermore, there are two variants of the Chromebook 11: the one that we have reviewed here is the consumer model (CB3-111), but there is also a C730 model that is aimed at the commercial and education sectors. The C730 is said to be more robust, with a 60 per cent higher rating for the drop test than the consumer mode. • What laptop should I buy?